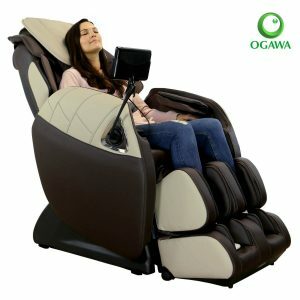 Ogawa massage chairs, designed and built by Cozzia, are branded solely for the distribution channel. In all manner and respect, inclusive of features, engineering, and design, they are the same company. With many outstanding models, Ogawa is a name you can trust in the world of in-home therapeutic massage chairs. 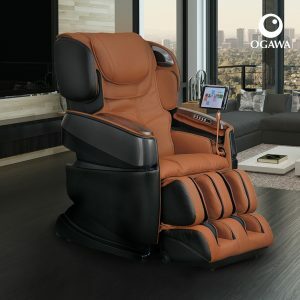 The Ogawa Active SuperTrac massage chair is no exception. This model is a next Level Up after their Ogawa Refresh model. A well built, fully featured, technologically advanced, nicely designed chair. Can it transport you to your health and wellness happy place? The reviews are consistently positive, especially for the price point. I spent weeks researching everything we possibly could on this chair. 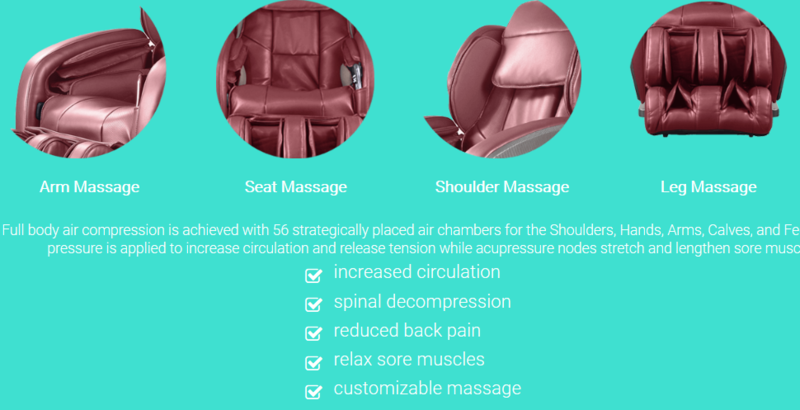 I talked to massage chair experts, congregate all possible reviews and tried it.Below is a comprehensive analysis after considering all aspects of the chair and similar comparisons in this class. There are few models I found that are similar to Ogawa Active in price and features. Some models we discovered in this price range (even from Respected Brands) we could not even consider for this review, due to either high price points and fewer features or simply a reliability issues. Click here to look at this overpriced model that we like to provide as an example on what not to buy. Lot's of similarities - much higher price point. Ogawa chairs are manufactured in China. NOTE: Here is the Industry secret: almost every single one of them are made in China. Brand such as Luraco is an exception and their chairs for the most part made in the USA). Look at the article here to see which chairs ARE NOT manufactured in China, or click here for bestsellers (mostly made in China). At the end of the day, name of the game is Quality Control. It is what makes a chair Bad or Good! SuperTrac is a 43 inches extended roller track. It might not be the longest track, but what makes it unique is that with SuperTrac you can be lying down (in the bed position), and rollers still will reach all the right areas in your lower back and buttock area. With L-track, you can't just lay down and get a massage in all the right spots. Ltrack is fixed. SuperTrac can mode and become flat. It is uniquely available in this model. The advanced roller system, called "Supertrac" utilizes the s-track functionality to deliver deep, penetrating massage to the entire spine. This technologically smart curve system enables healing penetration deeper massage into the areas of the cervical spine in your neck and down the entire length of your back. 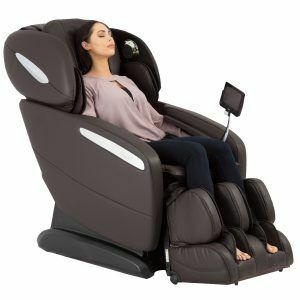 When fully reclined, you get the same deep massage not only in the neck and back but the seat and down the legs as well. It's like getting two massage chairs in one. A nice perk you don't see elsewhere. Note: Outside of this SuperTrac function, there is not a lot of unique features about this chair, not even a music system, which is standard on chairs in this price range. A chair that I recommend and that is listed below has music function + USB port to connect a Jumpdrive! If you're a fan of compression massage, here is good news for you. This chair delivers a full-body compression massage via 56 air chambers that are stacked in multiple layers. This is good therapy option for not only deep healing but also for increased circulation and blood flow. This chair delivers good comparable massage therapy for a home unit in this price range. There are two stages of zero gravity positions to choose. One is entirely reclined into a flat position, and the other into a deeper incline so that your feet rise above your heart. This position, designed initially to provide astronauts with weightlessness during takeoff, relieves your vertebra of all pressure and stress. This helps release tension in your entire body and increases blood flow for better circulation. 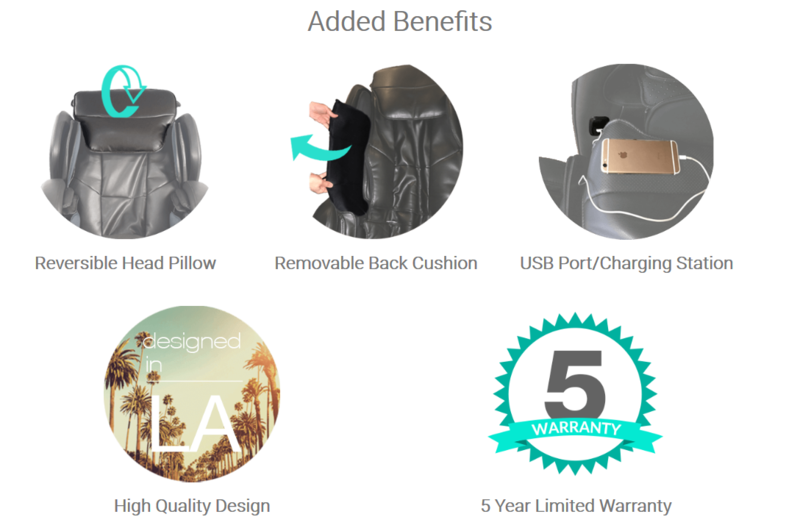 Company claims that chair offers the technology to help customize your massage and to receive one of the best massages. By using the data together with the Smart Curve technology, massage rollers are placed for a great massage every time. The computerized body scan ensures the massage is customized to fit your dimensions. You can also isolate the glutes and thighs for one massage type and have a separate massage for those areas than for the shoulders, neck, and back when sitting upright or reclined. 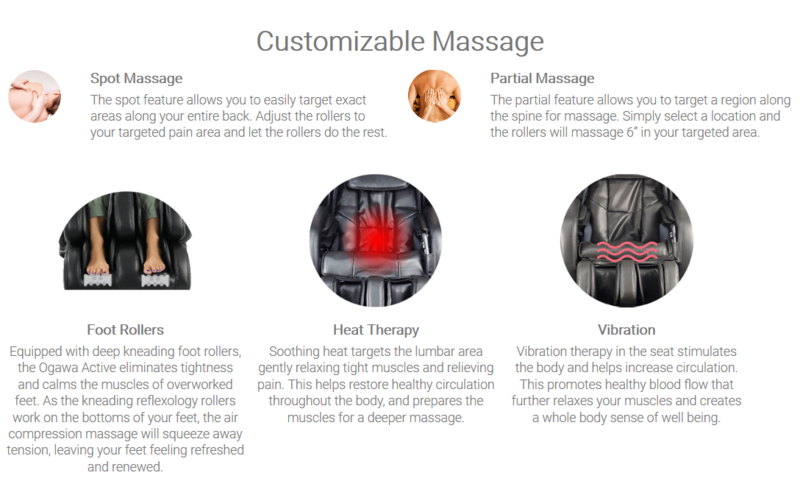 The manual modes let you build your own personalized massage just the way you like it, with the techniques, pressure, and intensity of your choosing. There are also two stretching modes, which are good for your neck, shoulder, back, waist, and hips. There's a partial massage as well as a spot massaging feature, which allow you to target tired, sore, or overly stressed areas only. There are vibrational massage and heat therapy to soothe sore, tight muscles and release connective tissue stress. The removable back pad is an excellent way to increase or decrease the intensity as needed. The kneading foot rollers deliver excellent deep kneading massage to the soles of your feet. The chair comes equipped with a USB charger so you can use and charge your tablet or smartphone while you lose yourself in restorative relaxation. There's a remote control for programming, selecting, and changing modes at any time, as well as a timer and pause feature, so you can start and stop intermittently without having to restart and re-scan. You do have to set it up yourself, but it comes with a manual, which in addition to instructions and tutorials, is also available online. If you don't like that type of thing and if available you can request white glove service. This will have delivery and set up all taken care of for you. What if I'm very tall (or very short)? The Active SuperTrac accommodates people from 5'2" to 6'4". Black, chocolate, graphite, and cherry. You get a five-year limited warranty with purchase. For more uptodate warranty information visit the Company website. The advanced SuperTrac roller technology massage is an excellent feature. You can isolate your upper and lower body with deep penetrating massage while sitting up or reclined. The quality design is beautiful, there are multiple colors to choose from, and the quality of materials is durable. Good number of airbags (56 air bags ) and different layers. The one thing to note, though, is if you’re sensitive to compression massage, try before you buy on this one. It’s serious compression we’re talking here. Active Chair is easy to put together, but when choosing a shipping information white glove delivery is always an option. 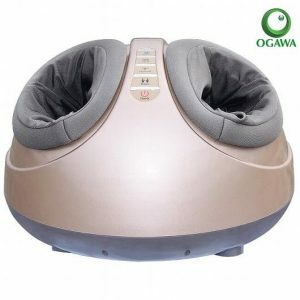 If you're in the market for something slightly different, like a massager for feet only, or a slightly higher or lower end product, Ogawa designs and build for the entire spectrum of wellness products. If you're after a foot massager ONLY, the Foot Therapy Plus is an excellent model. Priced right and fully featured, you won't go wrong with this easy-to-store massager that will bring you untold hours of relief for sore, tired, overworked feet. These are great to come to if you are on your feet all day for work or suffer from flat feet or high arches. They're also great if you just want to relax and rejuvenate. The Ogawa Refresh is a great option if you're looking for something that's just slightly easier on the wallet. It's not a budget chair by any (ahem) stretch. It's packed with helpful features such as heat, smart curve technology, body air compression massage, advanced rollers, zero gravity positioning, hand and arm massage, and the feature list continues. It could be a good option option that will just save you some cash. On the other end of the spectrum, if you're looking to bump up to the next strata, you might want to have a hard look at the Smart 3D massage chair. Highly technologically advanced, and powered by a tablet, this is luxury. It's also one of the quietest chairs out there. This stylish, polished, luxurious chair utilizes the latest in massage technology and engineering. It's reasonably priced and sure to deliver countless hours of relaxation and pain relief. 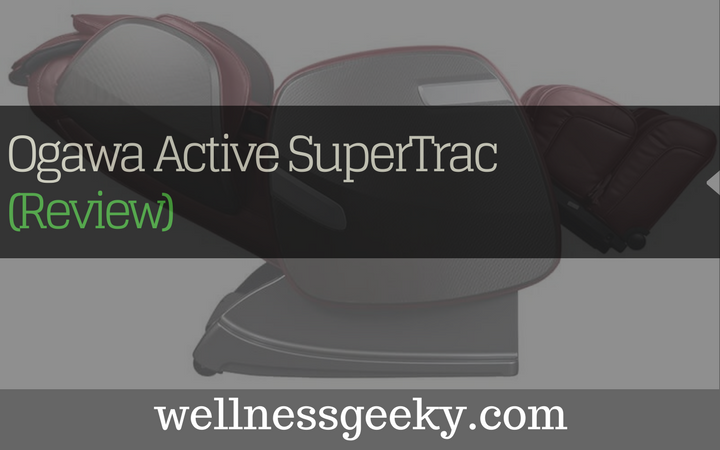 As one of the smartest and most sound investments in your wellness you can make, you will love the Ogawa Active SuperTrac for years to come without taking a chunk out of your bank account.